Credit to the PRAMO discord server for the information. Hmmm seems like a typical WG event, this is when people with an hour and half long bus ride have the advantage! Nice, I'm actually glad it isn't a long long grind. Not going to lie, Type 59 is super underwhelming (compared to undeserved rep) but way more fun than the IS-6. If you want to get it, go ahead, it's not there to impress anyone. A sort of 'relax and get stupid' premium tank. Also it doesn't make very good credits. But it can carry hard if you pay attention. Edited by Oicraftian, 17 January 2019 - 03:21 PM. Edited by slayer_____, 17 January 2019 - 03:23 PM. The Type's definitely gotten powercrept by IS-tard clone tanks. The person who developed the idea for a Type 59 event ought to be beaten. While they're getting on that, I say they make it so forum bans are IP-based, and the minimum battle count to post becomes a thousand at minimum. Has always been mediocre since they gave it pref MM. And even then it is still better than the 'T-44'. This tank needs a better gun. Either WG makes D-10T realistic or it gets enough gold pen to use. IS-5/IS-6/IS-3/IS-4 are not clone tanks. I bought the P.O.S. in the auctions....damnit. WZ-series, Glacial, 2sh, the upcoming 112-2, etc. You know, the half dozen or so literal Chinese clones of IS-series tanks, not to mention the other T-54 derivatives that are on par or better than the Type at tier. 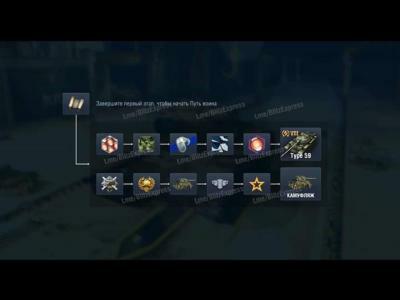 IS-2Sh is a tech tree tank in PC. Glacial/WZ-112 were China's realistic prospect at a pseudo historically accurate tier 10 getting roasted cuz WG. T-54's should be reworked in earnest, with Type 59 moved to tier 9. Giving the T-44 breathing space. Type 59's platform is just too good to be balanced against T-44. Actually I think an overhaul of alpha damage between guns is long overdue. 105mm L7 alpha goes down, D-10T and D-54 alpha passes them, D-54 sits strong at 380 or such. Then change the others. Edited by Oicraftian, 17 January 2019 - 06:13 PM. Can't wait to get that AVATAR! The gun kills this tank and the Mod 1. I didn't shell out the extra gold for the Ding camo, so I'll be happy to get that for it. Other free tidbits will be nice too. If I end up getting the tank, I'll at least get credits for it. In the past, I believe there have been some events where you get gold if you already have the tank...one can dream. Don’t even bother with that tank...it’s a steaming pile of s$#t.....better tier eight meds out there. I hate that tank. They are totally noob mobiles and I can’t pen them, especially not from my tier7 light tanks. Worst, is they can keep chasing me across entire map in end game, and while I throw beans at them seldom hitting, never penning, they reply with a derp that blows half my HP even when going full speed up and down the dunes. It’s the principle of a noob mobile. The gun is Russian, the armor is too. Drive straight, shoot in the face, I hate it.